Safe Shores Monitoring has launched an app that transforms a smartphone into a lone worker protection device with impressive safety features as part of an £800,000 investment into their business. The Glasgow-based lone worker monitoring specialist developed its Companion Application to utilise a range of smart phone features to ensure employees working alone are safe from danger. In what is described as an industry first, Companion offers an integrated, cross-platform internet of things (IoT) connected lone worker application. The app is connected by Safe Shores Monitoring’s Police Preferred Specification Archangel cloud service to deliver a contextually-aware, intelligence-driven solution. Safe Shores Monitoring believes Companion delivers the most advanced man-down detection system available by harnessing the array of sensors available within the device and combining sensor data with advanced algorithms to validate genuine situations of jeopardy. The app instantly pairs with the smallest Bluetooth SOS button to come to the lone worker market. The Companion App also works without the need of mobile coverage. Other features of the app include screen-lock button override which can be pressed discretely if circumstances prevent the lone worker from speaking or indicating they need help. 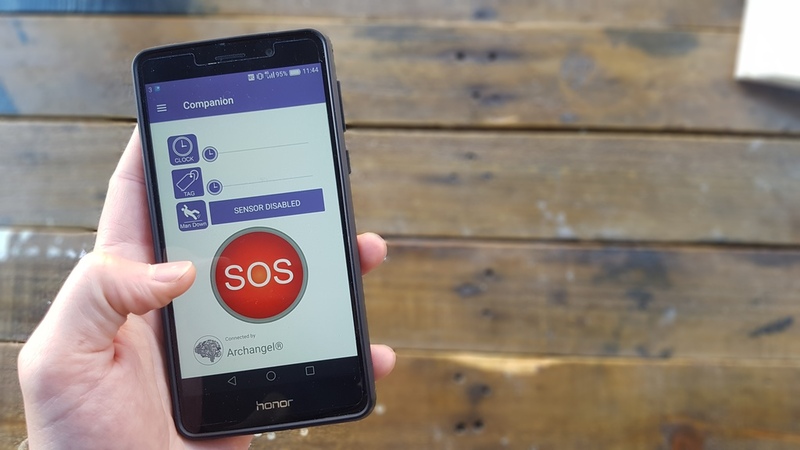 Companion uses sophisticated location technologies, including the phone’s GPS to trace the location of the user, which can then be shared with emergency services if required. Features of the app enable system users to record and report their working activities and stay safe. Tom Morton, CEO of Safe Shores Monitoring, said: “Our Companion App has been developed by our in-house team of software specialists to put the most effective lone worker safety device in the hands of any employee who has a smartphone. The Safe Shores Monitoring’s lone worker system can be connected to its state-of-the-art Alarm Receiving Centre (ARC) that operates 24/7, 365 days a year. The ARC and system are certified to the highest industry standards, which means it can bypass the 999 system to deliver priority access to police, fire and ambulance control rooms across the UK. Based in Dunoon, Argyll, the ARC’s staff are highly experienced and trained to locate the alarm user, listen to the call and assess the situation. The ARC offers emergency services mission-critical information if they are required to offer support. With NHS Protect closing, how can the NHS help protect its lone workers now?